It’s Friday, Can I Drink Yet? Happy Friday, everyone. We made it through to week’s end. And you know what that means. It’s time for a drink. 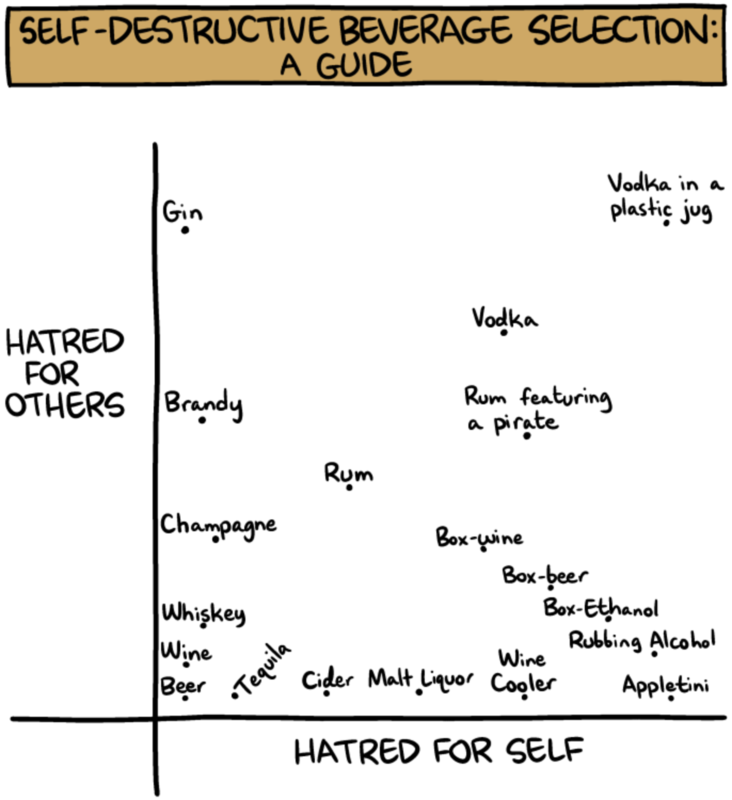 Thanks to one of my best mates for sharing this comic from Saturday Morning Breakfast Cereal. Credit for the piece goes to Zach Weinersmith. Author Brendan BarryPosted on 23 February 18 23 February 18 Categories InfographicTags alcohol, illustration, infographic, just for fun, Saturday Morning Breakfast Cereal, scatter plotLeave a comment on It’s Friday, Can I Drink Yet? You all know that I love small multiples. And we have been seeing them more often as representations of the United States. But today we look at a small multiple map of London. 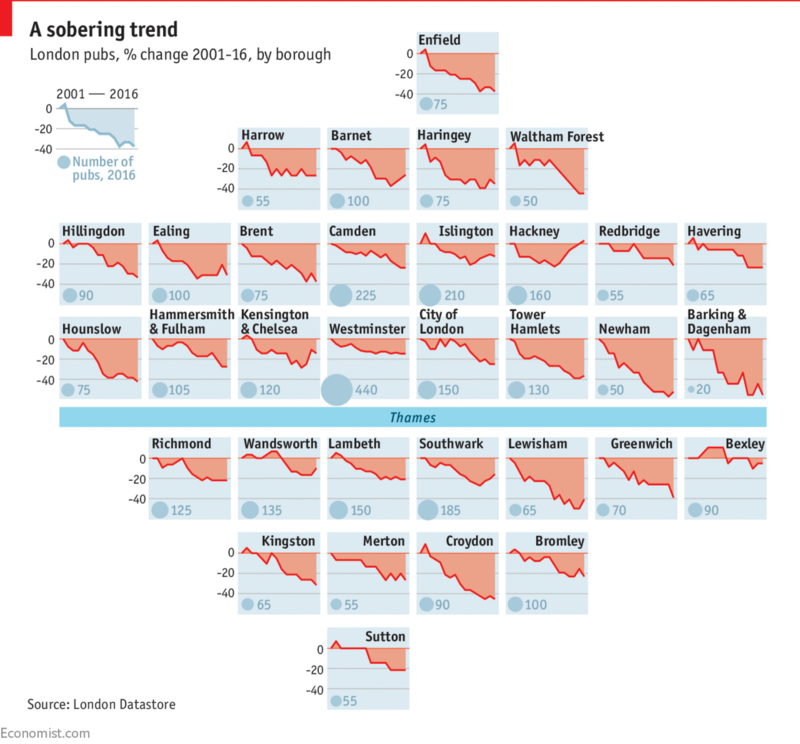 The piece comes from the Economist and looks at the declining numbers of pubs in London. With the exception of the borough of Hackney, boroughs all across London are seeing declines, though the outer boroughs have seen the largest declines. The only thing that does not work for me is the bubble in each tile that represents the number of pubs. That gets lost easily among the blue backgrounds. Additionally, the number itself might suffice. Boston Beer Company is the parent company of Sam Adams, which is definitely one of those beers I imbibe when I visit Boston. But, as one of the larger craft brewers in the United States, it finds itself under immense competition. This article from Bloomberg examines the situation the brewery finds itself in from a share price, growth, and revenue standpoint. Credit for the piece goes to the Bloomberg graphics department. Another Monday, another week, another post. But this week we will try to get by without any more Brexit coverage. So what better way to cure a hangover than with more booze? So let’s start with some fancy wine. I meant to post this piece a little while back, but yeah that unmentionable thing occurred. Now we have the time to digest as we sip and not slam our beverage of choice—the Sun’s over the yardarm somewhere I figure. FiveThirtyEight took a look at expensive wines. 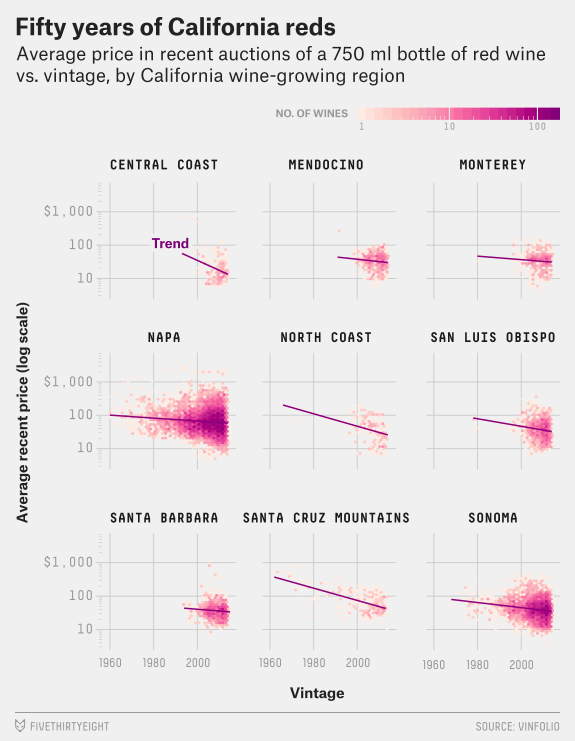 It compares the pricing at various vintages for France, California, and other wine-producing regions. On the balance, a very smart piece with some great graphics. Your humble author is out of town today. And unfortunately he is not watching a ball game. But if he were, he would be drinking a beer. And even more unfortunately, his favourite team and favourite ballpark has the most expensive beer. And most unfortunate, the other two teams he is perhaps most likely to watch have the…same most expensive beer. 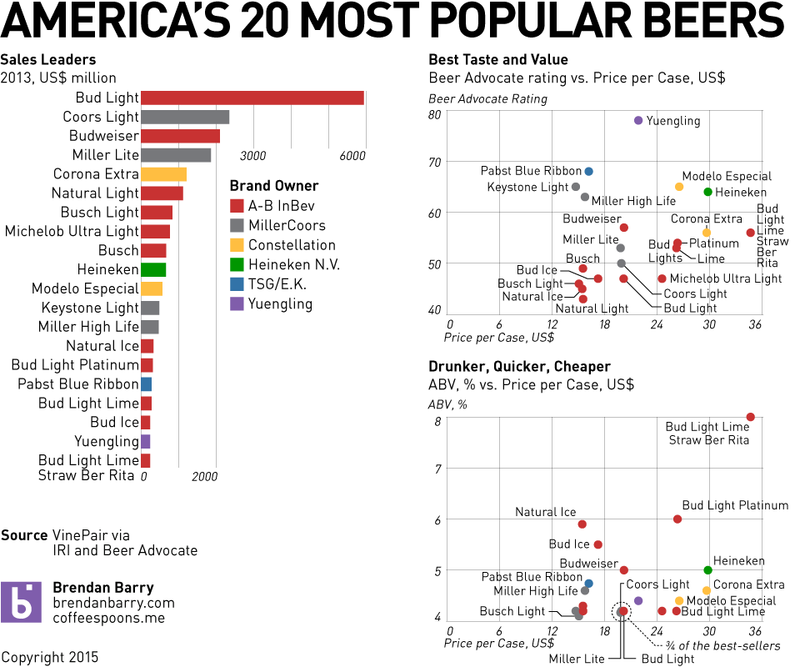 Business Insider charted the prices and the price per ounce. To be fair, I am often too busy scoring a game to get drunk during a game. 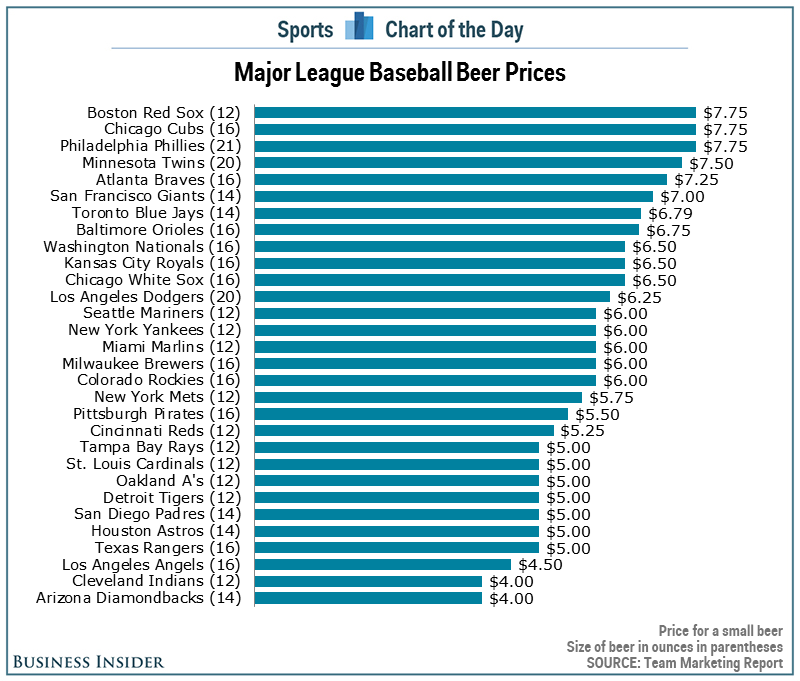 It’s expensive getting drunk at Fenway. And Citizens Bank. And Wrigley. Credit for the piece goes to Business Insider. Now that it’s Friday, it’s time for happy hour drinks. Well, maybe not quite yet. Let’s get through the workday first. But over at the Wall Street Journal, together with Yep, they looked at which cocktails are most popular in eight cities based on Yelp reviews. They do note that the metric is not perfect as people will complain about Manhattan in a New York bar review but not actually drink a Manhattan. But, honestly, when you’ve had a few cocktails, the maths are bound to get a bit fuzzy. Of course the next step would be to make an interactive version with links to recipes. 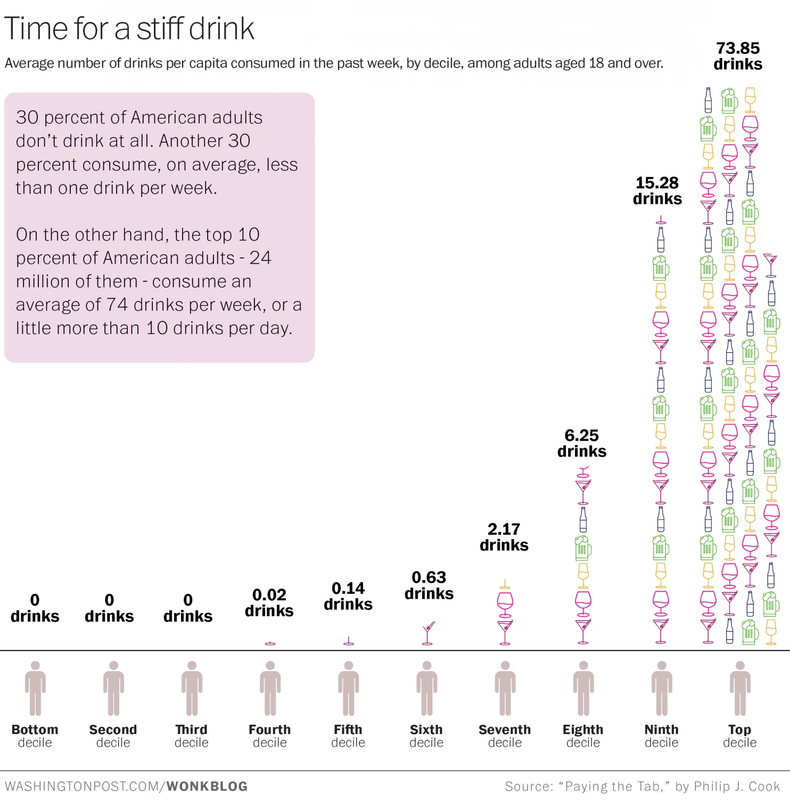 And from the visualisation side, you could cluster the data by drink bases. And no, the martini should not start with vodka. Come on, people, you use gin. Credit for the piece goes to Rani Molla. Or so says Adweek. I would heartily disagree about their inclusion of Yuengling in their group of crappy. Though the other nineteen, yeah, I would tend to agree. Regardless, the infographic that sparked the Adweek post is quite blah. I do enjoy the illustrations of the bottles and labels, but the data visualisation below is weak. So because of Yuengling, I decided to take a quick stab at ways to improve it. 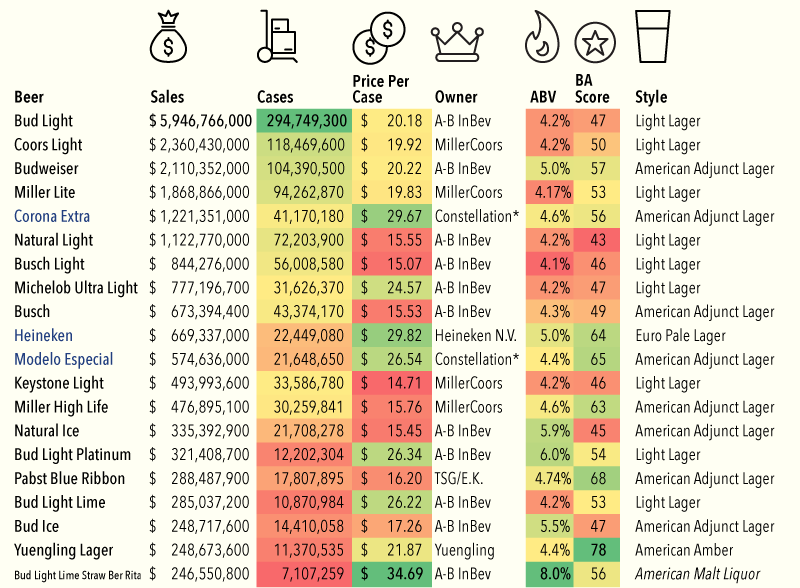 My first finding in the data was that the different brands were assigned a Beer Advocate rating, and Yuengling rated the highest—though not terribly high overall. Still, unless you are looking to get drunk, it does offer a good taste/cost value among the consideration set. Credit for the infographic goes to VinePair. Happy Friday, everybody. I’m looking forward to a pint. 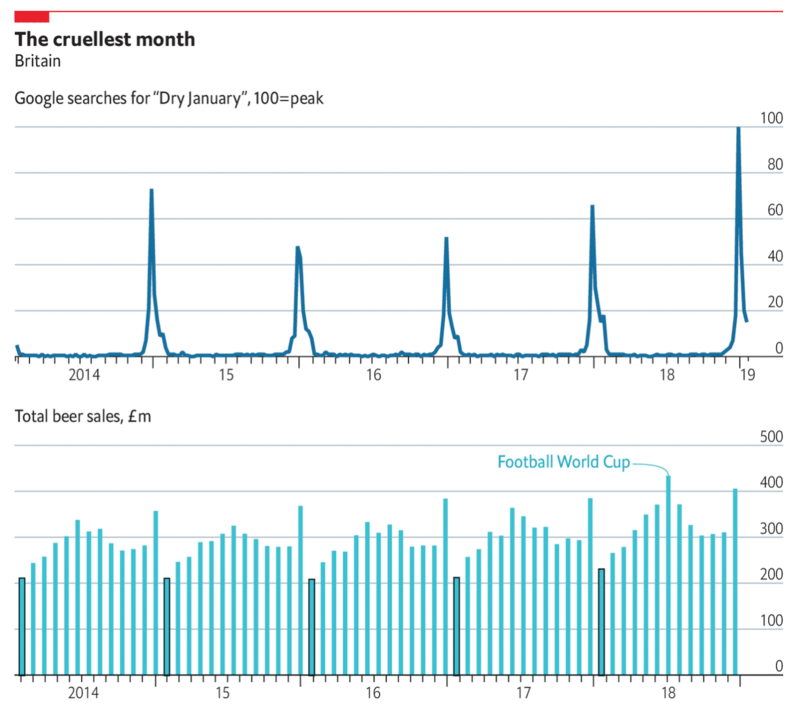 But thanks to some research, as an American, I might actually be looking forward to 10 pints if I fall within the highest decile of American drinkers. They imbibe on average over 73 alcoholic drinks per week. Yep, that means over 10 per day. Bottoms up, Merica. The Washington Post brings up the graphic summary of the study. Credit for the piece goes to Christopher Ingraham. Which Countries Do You Drink Like? Happy Friday. Happy Memorial Day Weekend. Happy Summer. Just about all of those things mean a drink of some kind. And thanks to Time, we can look at ourselves and find out what drinking culture each of us best reflects. The data comes from the WHO and looks at both total consumption and then share of consumption. 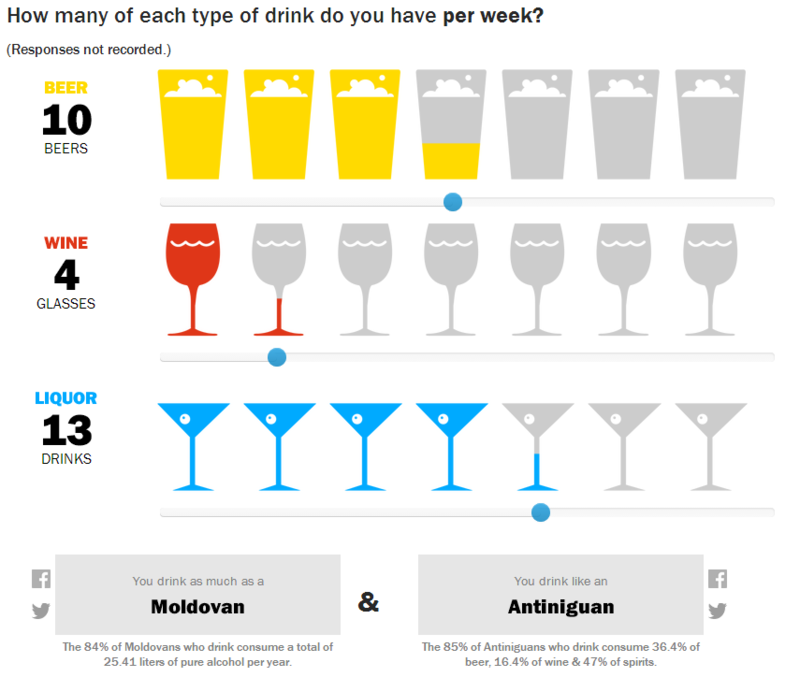 So last week I drank like a Moldovan and most nearly like an Antiniguan. Of course, they meant Antiguan. It just so happens I caught the spelling error. But since most of last week can be chalked up to a house party, I did the week before too. Then I drank like a Belarusian in the style of Guyanese person. And for those of you who know me, yes, things like this are exactly why I record all the drinks I consumer in my little black book. Credit for the piece goes to Pratheek Rebala. Author Brendan BarryPosted on 23 May 14 11 November 16 Categories InfographicTags alcohol, dot plot, infographic, information design, interactive design, self-surveillance, timeLeave a comment on Which Countries Do You Drink Like?